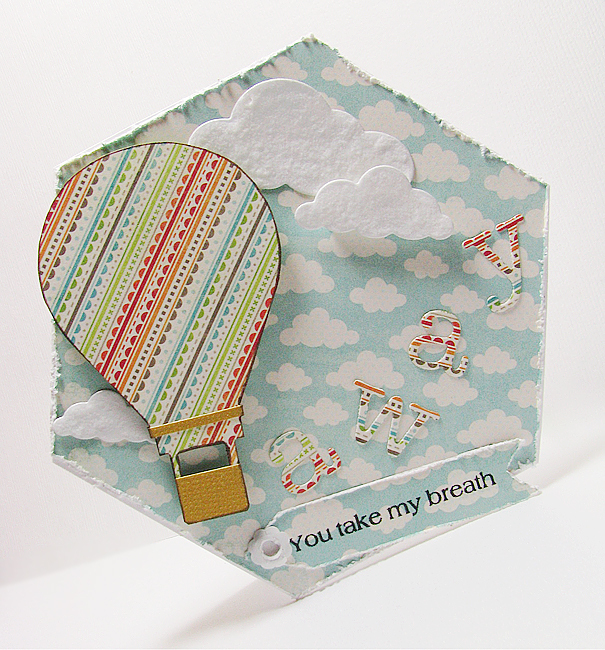 My hubby goes trough some difficult times lately, so I wanted to cheer him up not only with my words of support but also by making a card for him... For my card I used a hexagon template from Hexagon Shaped Card Set and sentiment and balloon template from HOT AIR BALLOON Set from The Cutting Cafe. Amazing and inspiring sets!! Хочу показати вам листівочку, яку зробила вчора для коханого чоловіка. Без причини, просто так, аби підтримати його на дусі у складний для нього час. Для листівки я використала два набори від The Cutting Cafe: Hexagon Shaped Card - для шестикутної форми листівки, HOT AIR BALLOON - з нього взяла шаблон повітряної кулі та напис. Отримала масу задоволення, поки робила листівку!! For the sentiment I cut off last word and put it in separate letters cut with Memory Box die. Clouds are Memory Box die as well. On colds I used Crushed Velvet to give them a bit of a soft look. 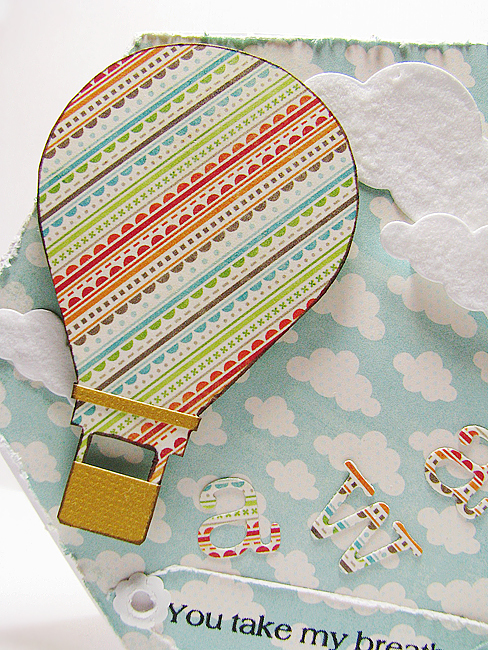 Balloons basket is paper pieced. One of the clouds and hot air balloon I've put on foam adhesive dots. Напис я взяла без останнього слова. Його я виклала на листівці окремими літерами, вирізаними за допомогою ножа Memory Box. Хмарки теж вирізані ножем цієї фірми та прикрашені Crushed Velvet Flock, такою собі пухнастою пудрою. Папір від ММЕ. Куля та одна з хмарок прикріплені на об'ємні квадратики. Дякую за ваші чудові коментарі!!! I jut love how you put this together!! So inspiring! Love this! What a great idea! awesome! Love your card. That hot air balloon is perfect too. Gorgeous card, I love the shape and the fresh summery feel. Love-tämä on aivan loistava -kesäinen ja kaunis kortti ! fabulous card a super shape thank you for joining our challenge at whoopsie daisy this week. A beautiful creation! 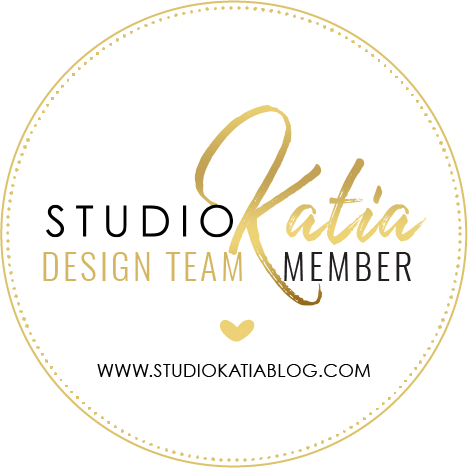 Thanks for playing at The Crafty Pad this week in our To Die For Challenge! Very different, so pretty! Thanks for joining us at Whoopsi Daisy this week. Thanks for playing with us at Whoopsi Daisy. What a lovely card Lilia, I'm sure your husband loved it! Also congrats on your baby girl, good to hear she's doing well now! What a lovely idea, and such a great card. Bet your husband was really touched by this. Thanks for joining us again at THE CRAFTY PAD with another of your creations. Love your card, Lilia, so original! Thanks for sharing it with us at Deep Ocean this forthnight! Lovely this balloon. And the song is also a great one. Fabulous, love the shape...thanks for joining us at Divas! Gorgeous creation....thanks for joining the AG challenge of the Divas! What a fabulous card. Thanks for playing with us at BunnyZoe.